About beIN SPORTS CONNECT U.S.A.
beIN SPORTS CONNECT is a sports streaming service available in the U.S. and Canada. This service is property of the beIN Media Group. Sports coverage for this service includes football and beach soccer, rugby, motor sports, boxing, cycling, handball, horse racing, judo, tennis and volleyball. beIN Sports' football coverage in the United States is cemented by the broadcasting rights acquired for this region in the world, which include top-caliber club competitions in Europe, along with some of the best domestic soccer leagues in that continent. Added to that, this streaming service offers international soccer national team action, featuring both friendly games and competitive matches. beIN SPORTS CONNECT is a streaming service that allows USA-based subscribers to access real-time streaming of matches and sports shows online or via mobile devices. It offers viewers access to numerous channels, including beIN SPORTS, beIN SPORTSen Español as well as the overflow programming on beIN SPORTS 2, beIN SPORTS 3, beIN SPORTS 4, beIN SPORTS 5, beIN SPORTS 6, beIN SPORTS 7, beIN SPORTS 8, beIN SPORTS 9, and beIN SPORTS 10. This streaming service provides high-definition broadcasts via participating OTT, cable and satellite providers. A suscription and a broadband internet connection is needed to use this service. Authenticated subscribers can access beIN SPORTS CONNECT on broadband-connected computers, mobile devices or smart phones, this includes subscribers to the following TV providers: AT&T U-verse, Atlantic Broadband, Bright House Networks, COX, DIRECTV, DISH, Hotwire Communications, Optimum, Time Warner Cable, and Verizon FiOS. beIN Sports Connect offers streaming which is available for all the content broadcast live on beIN Sports and beIN Sports en español. This streaming service may be accesed via their website, as well as on the iOS and Android apps. fuboTV is now an official beIN SPORTS CONNECT authenticated partner. fuboTV subscribers will now have access to the 9 additional beIN SPORTS channels with access to live broadcast events only shown only on beIN CONNECT. Please be advised that if you do not find your TV provider on that list, then you cannot access beIN SPORTS Connect. There is no option to purchase this service as a separate subscription if your TV plan does not include beIN SPORTS. beIN SPORTS Connect has apps for iOS and Android devices. 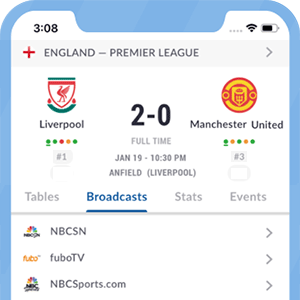 Also, to the live streaming of matches, users can also access highlights, news, and exclusive analysis both for soccer as well as other sports, including rugby, motorsports, and cycling. *Got itLive Soccer TV does not provide beIN SPORTS CONNECT U.S.A. live streaming. The information provided on this page is simply beIN SPORTS CONNECT U.S.A. soccer TV schedule.